Best-in-class may be an understatement for the Leica SL (Typ 601) Mirrorless Digital Camera, an outstanding full-frame model that is offering professionals the "new Leica experience." This generation of Leica is aimed to take the top spot of modern imaging technology and by the implementation of an outstanding 24MP CMOS sensor and Leica's Maestro II processor, it will deliver among the best in image quality with sensitivities ranging from ISO 50-50000. The sensor also forgoes the use of a low-pass filter in order to maximize possible detail, especially with the use of Leica's outstanding lens lineups. And, to make the camera a true professional's tool, Leica has incorporated internal DCI 4K (4096 x 2160) video recording at 24 fps in a Super35 mode, along with the L-Log gamma for maximum dynamic range. Beginning with stills, the sensor and processor combination delivers high-resolution images at a rate of up to 11 fps. The 2GB internal buffer also allows for bursts of up to 33 DNG files or unlimited JPEGs. The Contrast AF system is claimed to be the fastest among full-frame cameras with 49 fields to work with. This ensures that photographers will not miss the decisive moment. Video is outstanding, with UHD 4K (3840 x 2160) at 30 and 25 fps available in addition to DCI 4K when using the camera's Super35 mode. Alongside this impressive resolution is the ability to utilize the L-Log gamma, a super flat profile that maximizes the dynamic range of the image and gives editors more information to work with in post production. Video is easily recorded internally via the UHS-II and UHS-I standard SD card slots at 4:2:0 8-bit sampling rate though it can be output over HDMI with 4:2:2 10-bit sampling. Also available is Full HD (1920 x 1080) and standard HD (1280 x 720) at up to an impressive 120 fps for slow motion in the camera's full-frame mode. Numerous other video recording features were implemented on the SL (Typ 601) to make high-quality recording easier, this includes focus peaking, exposure simulation, clipping/zebras, grid overlays, aspect ratios, and safe area. Audio is also supported with a built-in stereo microphone and users can add both a 3.5mm headphone jack and 3.5mm microphone input with the optional AA-SCL4 Audio Adapter. Manual and auto audio control is available. Made in Germany from two blocks of solid aluminum, the SL (Typ 601) fits right in with Leica's other precision made imaging tools. This body is designed for intuitive use, with numerous dials and buttons in addition to the implementation of a rear 2.95" 1.04M-dot rear LED touchscreen for hybrid operation as part of Leica's Professional user interface. The body also offers a spacious 0.66" EyeRes 4.4MP EVF with a fast refresh rate of 60 fps and a magnification of 0.8x for more natural handling and composition. The weather-resistant body has a variety of other features packed into it with dual SD card slots, one with the UHS-II standard and a backup with the UHS-I standard, as well as a 1.3" top monochrome LCD screen for quickly viewing and changing exposure settings. Along with all of this, the SL (Typ 601) has built-in Wi-Fi connectivity for remote control and image capture using the Leica SL App and a GPS unit for geo-tagging your photographs. 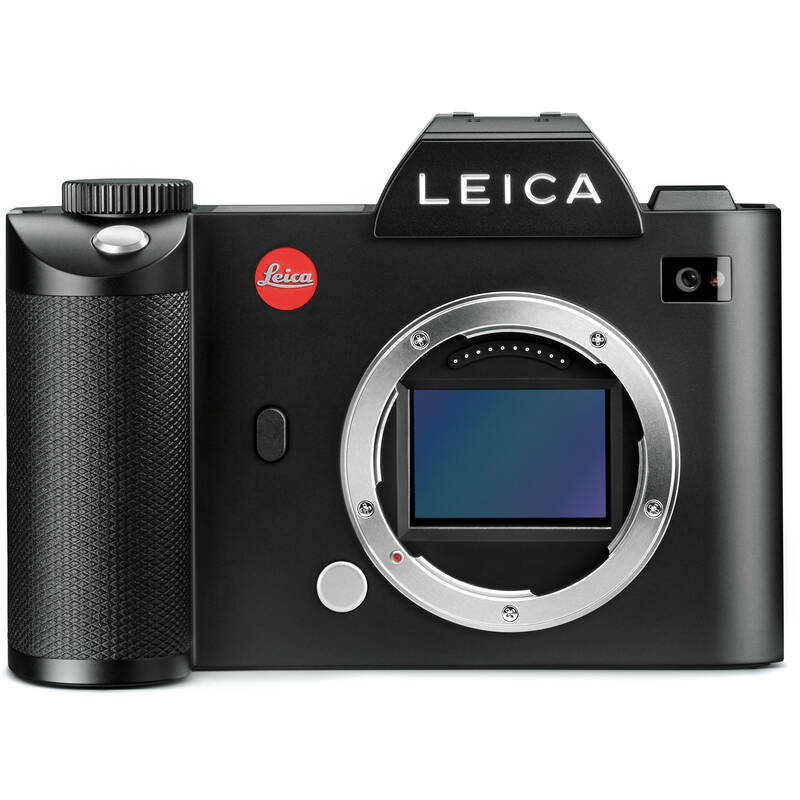 Milled from two solid blocks of aluminum and packed with the latest and greatest in imaging technology, the Leica SL (Typ 601) is a full-frame mirrorless camera ushering in the new, professional Leica experience. The SL takes on all fronts with outstanding 24MP stills and high-quality DCI 4K video, along with a best-in-class 4.4MP EVF with a magnification of 0.8x. Optimized for speed as well as quality, it delivers one of the fastest AF systems available in a full-frame camera as well as a burst rate of 11 fps. With exceptional quality and fast operation, the SL (Typ 601) allows shooters to take on nearly any scene with ease, be it nature, sports, action, or press photography. Packed with a phenomenal 24MP full-frame CMOS sensor that omits the low-pass filter and the Leica Maestro II processor, the SL (Typ 601) will deliver sharp, finely detailed images throughout the wide sensitivity range of ISO 50-50000. This setup will also enable speed, with burst shooting up to 11 fps for up to 33 DNG frames, or unlimited JPEGs, thanks to a 2GB buffer. DCI 4K video is also supported at 24 fps along with Full HD at up to 120 fps for slow motion capture. Furthering the camera's performance is a fast Contrast AF system, which Leica claims is the fastest available in a full-frame camera, which uses 49 fields to lock on quickly and accurately. Ultrasonic dust cleaning further ensures image quality remains at its peak by removing small particles without the need for deep cleaning. First seen in the Leica T, the renamed L bayonet mount offers users the ability to connect full-frame SL-series glass which benefits from electronic communication for blazing fast autofocus, electronic aperture control, and optical image stabilization. The mount also works with existing and future TL-series lenses, though in a reduced resolution APS-C crop mode. Additionally, as with most mirrorless today, the L mount can accept a variety of adapters, such as the M-Adapter T which provides shooters with access to the entire M-mount lens library. Leica will have adapters for the S, R, and Cine series as well, ensuring compatibility with a range of Leica's best lenses. High-quality video has become a highly important feature for numerous hybrid shooters and Leica has taken steps to deliver the best video available with the implementation of DCI 4K (4096 x 2160) video at 24 fps in the Super35 mode for true, cinema quality. Alongside this impressive resolution is the ability to utilize the L-Log gamma, a super flat profile that maximizes the dynamic range of the image and gives editors more information to work with in post production. L-Log also allows for better color matching with existing systems and has similar characteristics to Cineon, which is used for film digitization. This is easily recorded internally via the UHS-II and UHS-I standard SD card slots at 4:2:0 8-bit sampling rates. When output over HDMI however, this can be improved to 4:2:2 10-bit sampling, ensuring the maximum image quality possible with the full-frame sensor. Super35 and full-frame options are also available, depending on your resolution and frame rate. The SL offers also UHD 4K (3840 x 2160) at 30 or 25 fps in Super35 and Full HD (1920 x 1080) and standard HD (1280 x 720) at up to an impressive 120 fps in full-frame mode for slow motion. Numerous other video recording features were implemented on the SL (Typ 601) to make high-quality recording easier, this includes focus peaking, exposure simulation, clipping/zebras, grid overlays, aspect ratios, and safe area. Audio is also supported with a built-in stereo microphone and both a 3.5mm headphone jack and 3.5mm microphone input can be added through the use of the optional AA-SCL4 Audio Adapter. Manual and auto audio control is available. Spacious and comfortable, the high-resolution 0.66" 4.4MP EyeRes EVF found on the SL (Typ 601) features a best-in-class magnification of 0.8x along with a field of view of 37°. This system also has a refresh rate of 60 fps, ensuring crystal clear and smooth imagery for the best shooting experience possible. Hybrid operation as part of Leica's latest Professional user interface is enabled through the use of the 2.95" rear LED touchscreen. This display offers a high resolution of 1.04M-dot for crisp imagery during shooting. This screen also features a variety of different assist tools for capturing video and stills. In addition to this, the screen has anti-fingerprint and anti-scratch coatings along with a wide viewing angle of 170°. Claimed by Leica to be the fastest autofocus available in a full-frame camera, the SL (Typ 601)'s Contrast AF system uses static, dynamic, and automatic with face detection modes. This offers point, field, and zone options which can be broken down into 9 zones, 37 or 49 fields for excellent customization in locking down your target. Also, it has a Touch AF setting for tapping where you want to focus and an AF assist lamp will help in low-light conditions. For security, Leica has incorporated two SD card slots into the SL (Typ 601), one with the fast UHS-II standard and one with the UHS-I standard. This ensures that professionals will be able to maintain a backup as they are shooting in case of card failure or loss. Also, it expands the capacity of the card during exceptionally long days of shooting or recording video. With a full, heavy-duty grip and a variety of buttons and dials, the SL (Typ 601) is designed to be one of the simplest, fastest, and most intuitive cameras to operate. The menu is optimized for speed and to be easy-to-understand, limiting time getting used to a new system and ensuring that you can find and adjust critical settings when you need to. Hybrid operation in the form of the latest Leica Professional interface is available thanks to the implementation of a rear touchscreen. This makes swiping through settings and images intuitive and enables Touch AF and shutter functionality. Additionally, the body has a top 1.3" monochrome LCD that shows current settings for making fast changes without looking at the rear screen or viewfinder. Equipped with both a TTL-capable hot shoe and an X-sync terminal, users will be able to easily add light to their scene. The hot shoe features dedicated contacts for TTL automatic exposure with compatible flash units, such as the SF 64 and SF 26, or manual firing of third-party flashes with the center pin. Additionally, the X-sync terminal enables the use of strobes or radio systems that require the use of a PC sync port and the SL (Typ 601) has a maximum sync speed of 1/250 second. Milled from two blocks of solid aluminum and hand-finished in Germany, the SL (Typ 601) is once again a beautifully put together masterpiece from Leica. The use of aluminum guarantees durability over time and the body and lenses were designed to be sealed from the elements, protecting the body from intrusion from dust and water during less-than-ideal weather conditions. Staying connected is important in this day and age, so Leica has put an integrated Wi-Fi module on the SL (Typ 601). This allows users to connect to the camera using a phone or tablet via the Leica SL App, providing full control over settings such as aperture and shutter speed as well as triggering of the shutter. This makes it incredibly easy to work from a distance or with unusual angles and positions. A built-in GPS module furthers the camera's connectivity by automatically stamping time and location data onto your images. This allows users to quickly navigate their catalog by location and date to find their favorite shots or to remember where you stumbled upon that near perfect landscape. This unit also has a sensitivity of <1°. Records to open DNG format for compatibility with a variety of software and operating systems. Exposure bracketing from 1, 2, or 3 aperture steps for 3, 5, or 7 images which can be saved individually or automatically output as an HDR JPEG. Saves 14-bit DNG and 8-bit JPEG files in Adobe RGB, ECI RGB, or sRGB color spaces. White balance modes: preset auto, daylight (5200K), cloudy (6000K), shade (7000K), tungsten (3200K), HMI (5600K), fluorescent warm (4000K), fluorescent cool (4500K), flash (5400K), gray card, and manual from 2000K to 11500K. Drive modes include single, continuous slow at 4 fps, continuous medium at 7 fps, and continuous fast at 11 fps. Interval mode available for setting up time lapse. Time exposures up to 30 minutes. Exposure compensation of ±3 EV in 1/3 or 1/2 EV steps. Comes with strap and lens cleaning tissue. Box Dimensions (LxWxH) 14.3 x 10.0 x 7.4"
SL (Typ 601) Mirrorless Digital Camera is rated 4.9 out of 5 by 19. Rated 5 out of 5 by Anonymous from A wonderful addition to the Leica Family I have waited for a product like this for a few years now. I am glad it's finally here. This camera is an awesome tool that is both beautiful and durable. The image quality is outstanding-on par with other Leica optics I have used. I have tested it this the M-adapter (using several of my M glass) as well as the new auto focus zooms (24-90 & 90-280). I am using the new firmware 2.0 and am very happy with the camera's nimble handling and intuitive controls (which are very customizable and minimalistic). I still have more to learn regarding it's video capabilities-however, my preliminary research tells me that I will be more than satisfied! Rated 5 out of 5 by Barry from Dream Leica I have owned nearly every Leica made over the last 30+ years and without question this is their finest camera to date. So far I have only used my M lenses with the camera however with this camera's ability to ultra fine tune the focus allows for the quality of the M lenses really shine through. It is so feature rich that I have since sold my M 240 as this makes it obsolete. I believe the mirrorless system really adds to quality of the images. This is before acquiring as yet either of the SL zoom lenses or the release of the adapter which will allow one to use the superb S lenses that I own as well. No doubt adding those will make me love this camera all the more! Rated 5 out of 5 by GEORGE M. from Best camera I have ever used ! I have used Canon, Nikon & Leica (Pentax, Hasselblad, Bronica, Horseman in the film days), and this is the best camera I have used. Viewfinder is brilliant and accurate. Image quality is incredible. While my Leica M is better suited for wide angle prime lens work, when jobs require a zoom lens, the SL is the best in it's class. My editor (who sees images from almost all camera brands) was very impressed, and quickly noticed the quality improvement over images from my Canon 6d with L glass This camera is also built like a tank, and I expect many years of service from the SL I did really questioned the cost of this camera, but am very happy that I made the investment. Rated 5 out of 5 by Robert from The Best Leica To Date The SL represents another major product for the company that has produced a long list of revolutionary cameras dating back more for than a hundred years. With the SL, Leica builds on that history, but has taken a major step forward by utilizing today's technology in this camera. It checks the boxes on most of the features I require in an ideal camera: ergonomics, simplicity, build quality, image quality, adaptable lenses, mirrorless, bright electronic viewfinder, customization, and fit and finish, to name a few. In short, it looks good, it feels good, it takes incredible pictures, and it is a joy to use. Rated 5 out of 5 by Sal V from Fabulous Camera I have owned this camera for approximately 1 month now. I use it exclusively with my collection of M-Lenses. The focus assist is great overall but extremely helpful when utilizing the Noctilux lens. The camera is larger and heavier than the M240, but extremely well balanced when attached to larger lenses (24 mm Summilux, 50 mm Noctilux, 90 mm Summicron). Battery life is short and I recommend carrying a second or third battery when out shooting. Rated 5 out of 5 by lifeinanimage from Incredible Camera System! I purchased the new Leica SL a couple months ago and I now shoot exclusively with the SL coupled with the excellent M lenses using the M adapter. The SL system is truly a pro camera that enables me to see, no matter the light. I rely primarily on natural light and the ISO capabilities are phenomenal, rendering excellent images and detail even in the toughest of light conditions. 11 fps also enables me to capture conscious movement when photographing athletes, yoga and action. In my mind, a great camera system is really a means to an end. It simply allows the photographer to focus on creating pictures while gently stepping aside. The Leica SL is that camera. The EVF is a window into the world and one must experience it to believe the previews it is capable of. The price is steep but looks like Leica is truly innovating and pushing resources behind this camera so the number of AF lenses and accessories for this system are going to only go up in time. Highly recommended if you are looking to switch to mirrorless, want an alternate body to complement the M, or if you think your M is too slow. Rated 5 out of 5 by Seth from WOW! I was looking to get rid of my outdated Phase One camera and back. I also knew I wanted to go significantly lighter than the Phase One and was really interested in mirrorless camera systems. I checked out Fuji, Sony and Leica. At the end of the day I had to choose Leica based off the glass, image quality and portability. As someone who does a lot of commercial and editorial work, I rarely have clients asking for larger pixels in the images so far megapixels is more than enough. The glass is what Leica is known for and they don't disappoint here. Although, I will say that if you get the big SL glass and don't use the M Lenses (which work really well with the adapter) then you WILL need the battery grip so everything is a bit more balanced. The viewfinder is also incredible. What other camera or system gives you 4 megapixel viewfinder. It's insanely crisp, sharp and clear... not to mention HUGE. I can now see why so many people love and swear by Leica. I love this camera and lenses and am looking forward to more lenses coming out this year. I am glad I waited and made the switch to Leica. Rated 5 out of 5 by Jim from Amazing camera Absolutely amazing camera. I ditched all my Canon SLR equipment. Amazing picture quality. Easy to use menu. Best built, most robust camera in the industry. Gorgeous design. Bought 24-90 and 90-280 zoom. With the Leica SL they perform as well as prime lenses. For the first time Leica has priced competitively. What size are the DNG files from the Leica SL? Does Watson (or other company) offer a battery replacement that is less than $250US? One thing it says in the specs is... Hand finshed in Germany... Does that mean that the entire camera is made and assembled in Germany or is this AD speak ? Can the M-lenses without encoding be used (with proper mount adapter) in manual mode with this camera? Is there a view finder attachment that would let me adjust the angle of view much like the one you can buy for the type246 ? My shooting style works well with the adjustable viewfinder. At this time there are no such attachments made for the Leica SL. When was the Leica M7 discontinued? The Leica M7 film rangefinder was 2002-2018. Around May 2018 was the notification of it being discontinued. You can use any M lens with M adapter T and you DO NOT need a special view finder, the EVF works just like a SLR viewfinder, you will see what the lens see. Does the Leica SL have a full frame sensor? Is there a focus magnifier for the viewfinder? It has a electronic magnifier that works great. Even better with the focus peaking set to red.